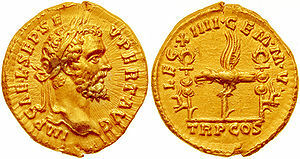 Aureus mintit in 193 bi Septimius Severus tae celebrate XIV Gemina Martia Victrix, the legion that proclaimed him emperor. The aureus (pl. aurei — "gowden") wis a gowd coin ofauncient Roum valued at 25 siller denarii. This page wis last eeditit on 7 Februar 2015, at 14:38.